Seducing Aries is usually fairly easy compared to some of the other zodiac signs. These are hunters and absolutely can’t resist the thrill of the chase. They’re very impulsive, have nerves of steel, and don’t have a problem taking risks to get what they want. Best of all they don’t over analyze a situation before acting. They’re also naturally flirtatious, and not overly intuitive. All in all, a perfect combination (for you)! The key to seducing an Aries is to make them come to you. Don’t let them realize you’re pursuing them, as that will turn them off. Think of them as a cat, and you’re a piece of string. Play hard to get. Alternate between flirting outrageously with them, and then appearing indifferent, timid or shy. They need to feel like the initiator here, and not you. Now that you know what motivates him, how do you get his attention? Try opening a conversation with an intellectual challenge, a new idea. 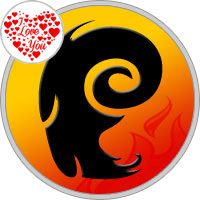 Aries man are always on the lookout for something new, adventurous, different. In fact, this is your best chance to attract their attention. If you cannot come up with a subject matter that get’s them excited, talking sports is a safe bet. Boxing, extreme sports, fencing, car racing are good subjects. To keep the conversation flowing and his interest peaking, voice your opinion, preferably a controversial one. Antagonize him a little bit with an opposite point of view on something he is passionate about. Walk the fine line between being provocative and pushy. At the same time be honest, sincere, enthusiastic in a verbal kind of sparring way. Aries men like to conquer. For an Aries, both male and female, half the joy (if not more) of any love relationship is in the pursuit. Aries men are shinny chivalrous knights at heart who fall in love with the Unobtainable Lady. Keep in mind that many Aries man lose interest once the “pursuit” phase is over. The success of seducing an Aries man is therefore in the balance between letting him do the “conquest” and you NEVER being totally “conquered”. If he starts taking you for granted, the game is declared null and void and over. Keep him guessing by maintaining an air of mystery. Remember, Unobtainable Lady. Repeat this mantra as often as necessary. Aries, as the first sign of Zodiac represents birth and is considered to be an infant. Well, just like an infant he’s aware of his own needs only. This does not mean he’s selfish – not in the slightest. It simply means he’s known to be absolutely oblivious to the fact that his needs, and fulfilling them, may be causing some inconvenience to others. This is why you must know that when getting into it with an Aries, you’ll see the irritable, inconsiderate and that difficult-to-handle side of him whenever his needs are not met. Understand that his actions don’t come from his selfishness but out of the mere fact that he’s this little astrological baby who needs to be taken care of first and foremost. On the other hand you’ll see that an Aries is actually very compassionate and always tries to cheer everyone around him up – that’s just the kind of guy he is. He puts on a show, of course it does mean he’s being the center of attention which is an added bonus, but it’s also for everybody’s entertainment. He likes to be the reason behind the good mood and the smiles, especially when he’s in love – then he’s extremely dedicated to the girl of his dreams. So, this is definitely the guy to fight for, the reward will definitely be great. The way to his heart is openness. An Aries would be very into romance and being open with what he wants and feels, so being with someone who’s going to hold back, play it hot and cold or try and pull some tricks is not even an option. Do that, and he’ll cool off in no time. You want to show him that you’re as courageous as him when it comes to investing in a relationship, and show him you’re not the one to fear getting hurt. He’s the kind of person who actually believes in mind blowing love and he’s always on the lookout for the perfect girl so you don’t want him to see you being timid or indecisive about what you want. Now, I’m not saying you should put yourself on the plate to be put in front of him. I’m actually not suggesting doing anything like that at all! In fact he’ll love a challenge of actually having to work for it, so making it seem like you’re not smitten with him right of the bat might be wise. But do it subtly, be very very smart about it – you want to come off as strong, in control and ready to take on someone like him in every way, you don’t on the other hand want to come off as someone who’s childish and likes pulling peoples chains. To the Aries man modesty and humility don’t really mean much, his giant personality can’t be tied down, and neither can he, but play your cards right, learn to stand strong, do it right beside him and keep up, and you’ll be showered with love and romance!